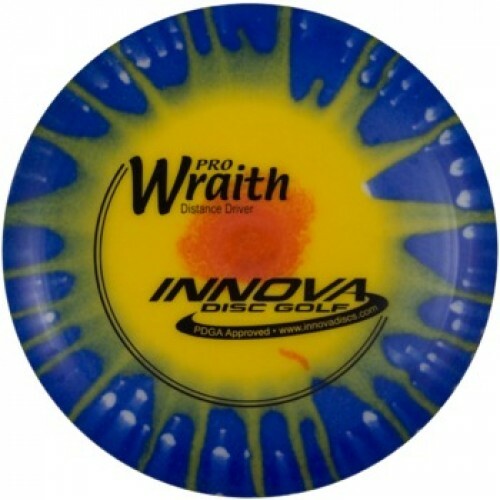 The Innova Pro Driver Wraith Dyed is a long stable distance driver. It is a stable flyer that performs predictably well in the wind with speed, glide and accuracy. Performs remarkably well at full speed and less than full speed. It can provide great distance for players of all skill levels. This disc golf driver is an excellent downwind driver and sidearm disc. The Star Wraith is endorsed by 12-time World Champion and Hall of Famer, Ken Climo. About Pro Driver plastic in general - it starts out being slightly less overstable. Pro Driver discs are more durable and retain flight characteristics longer than DX and other Pro plastics. They provide more grip than Champion. They provide more glide than DX, Champion and Star.